Live streaming of all matches of the India vs Australia series will be available online. Stopping a resurgent Australia would not be easy but a confident India would look to end the series on a high when they compete in the fifth and final ODI match in Nagpur on Sunday. India won their first three ODIs of the five match series and clinched the series 3-0, before losing the fourth ODI in Bengaluru. This was their first loss in the series. Australia’s 21-run win gave them first taste of victory on this tour. Both teams now head to Nagpur for the fifth and final ODI of the series. India will look to finish their final game on a high and win the series 4-1. The hosts have been dominated in the series with the ball and the batting. The Bangalore match saw both teams cross 300-run mark but India fell 21 runs short of chasing down 335-run target. David Warner and Aaron Finch put up a solid partnership of 231 runs, with Warner scoring 124 and Finch missing his hundred by six runs. Australia piled up 334 for the loss of five wickets in their 50 overs. In reply, the hosts managed to get 313 for the loss of eight wickets, with Ajinkya Rahane, Rohit Sharma and Kedar Jadhav scoring half-centuries respectively. When and Where is India vs Australia 5th ODI? India vs Australia 5th ODI of the five-match series will be played on Sunday, October 1, 2017, at the Vidarbha Cricket Association Stadium, Jamtha, Nagpur. What time does the India vs Australia 5th ODI begin? India vs Australia 5th ODI is a day-night encounter and it will begin at 1330 hrs IST (08:00 GMT) on Sunday. Where to watch live telecast of India vs Australia 5th ODI live on TV? India vs Australia 5th ODI in Nagpur will be broadcast live on Star Sports network from 1230 hrs IST on both SD and HD channels. 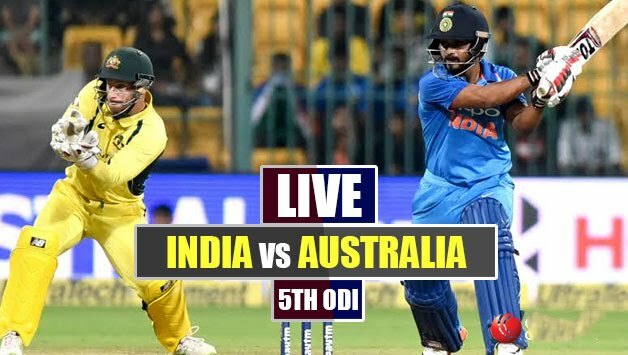 Where To Get Live Streaming of India vs Australia 5th ODI? India vs Australia 5th ODI will be live streamed on HotStar.